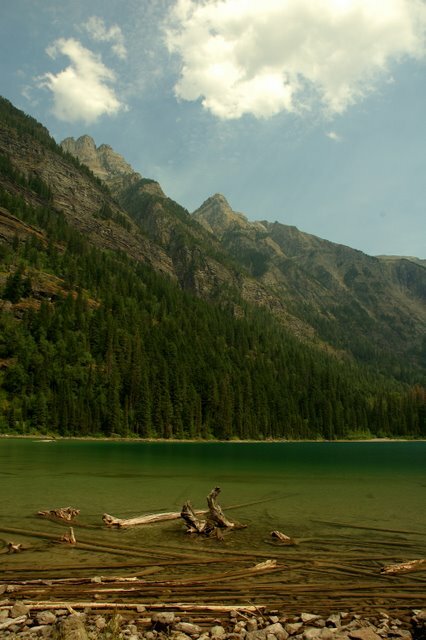 For the past four years I have traveled up to Montana for work. 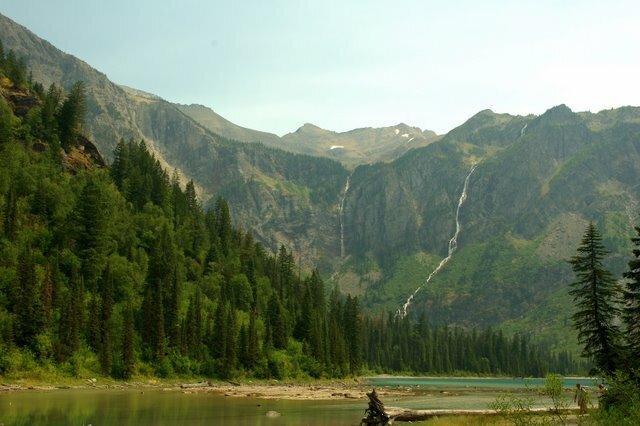 It is a beautiful state, at least the west part of it is, and you can find several outdoor activities to participate in. 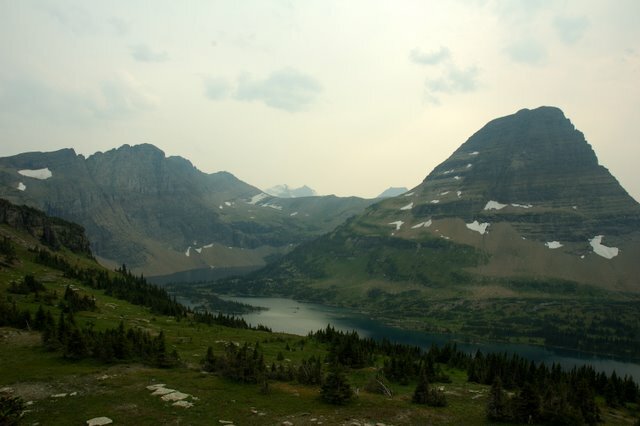 My third year in Montana was a toss up between going to Glacier or Yellowstone National Park. I chose Yellowstone and only three out of forty-five actually went there. 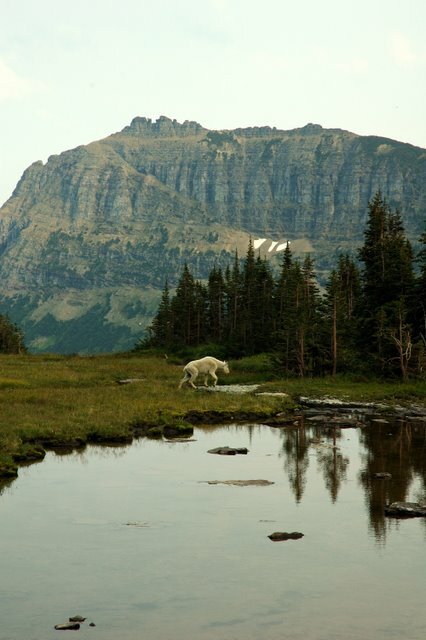 This year I wanted to head up to Glacier National Park. The day before we left, twelve people wanted to go. After a night out a Trixi’s, there was only nine people going. We were all excited about going and most, if not all, of us knew it was going to be a tease of what the park had to offer. Nathan, Emmett, Janice, Chris, Richard, Carey, Joshua, Marvin, and Russ. We took off at 830AM. 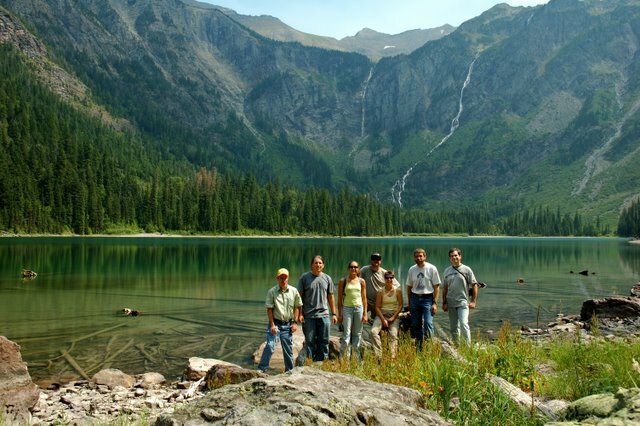 Traveling to Glacier National Park was supposed to be a 2.5 hour drive. 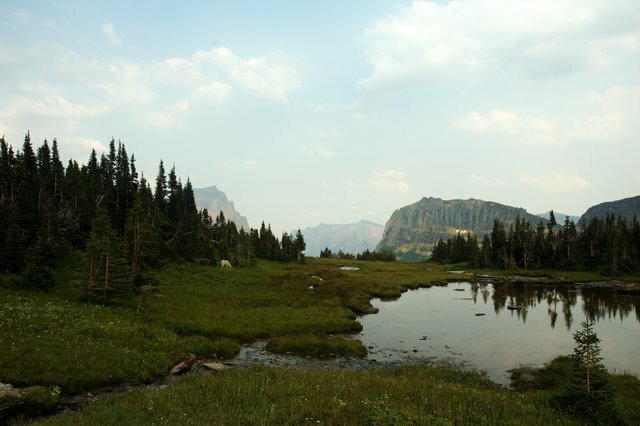 However, due to the fires that were burning through various areas of western Montana our highway was close. We took a detour towards Missoula and then went north. The small towns along the way added more driving time to the trip. The lake along the way up though was pretty. We took a quick break after a couple of hours. It was well needed. We arrived at the western entrance to the park at around 1230PM. The smoke from all the fires wasn’t that bad in the park. I had been monitoring their web cameras before hand to see how things where. With the slight breeze going westward, I think it helped move and keep most of the smoke out. Once we stopped for some snacks and lunch, we drove up above Lake McDonald to our first day hike trail. 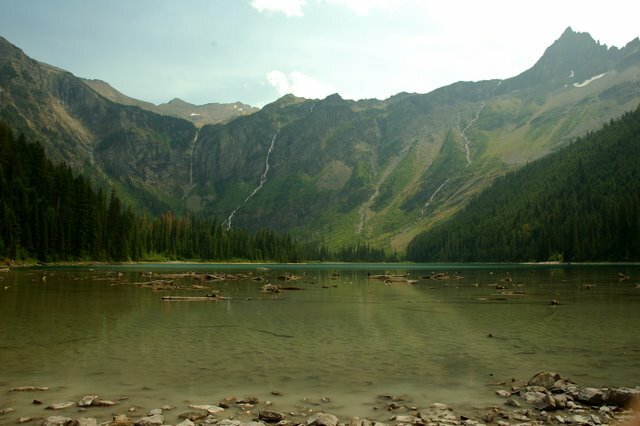 It was called the Avalanche Lake Trail. 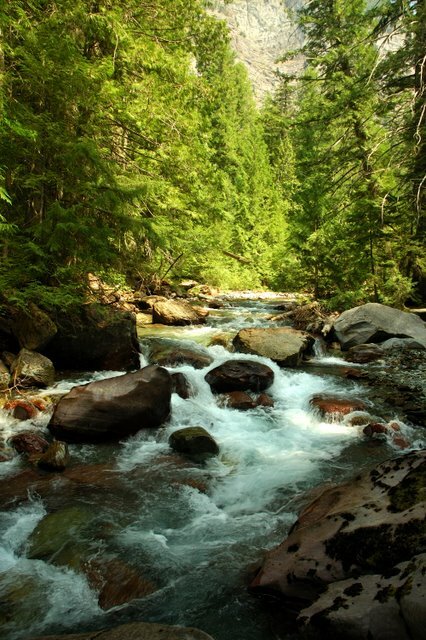 On our way up to the lake, some 2 miles one way, the trail went along Avalanche Creek. 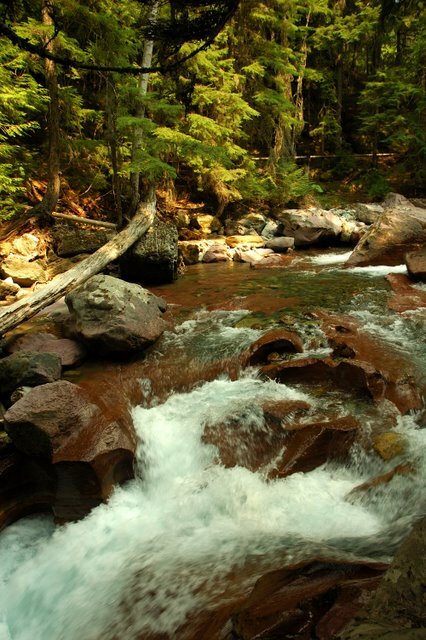 It was a really pretty creek with the red rocks and clear water. Some of the water was actually a light blue-green color! After taking a few photos, we made our way up to the lake. We saw a mule deer along the way too. She wasn’t afraid of anyone, but it was interesting to see her there all alone. Shortly after coming in view of the deer we came to our final destination. 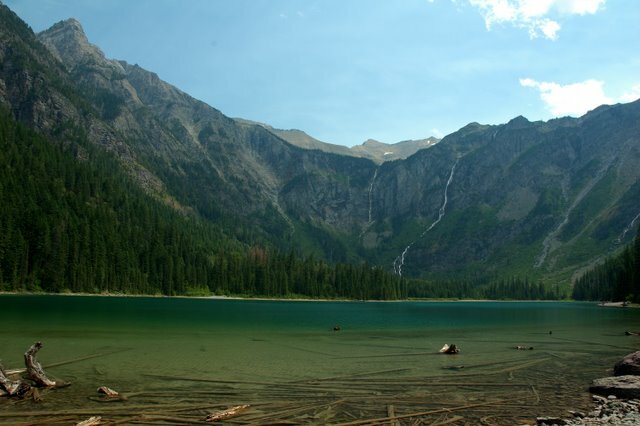 It was Avalanche Lake and it was beautiful. Each of us slowly made it around the lake while taking photographs and just admiring the natural beauty that surrounded us. Before we headed back, we took a group photo. Russ had continued along the trail instead of going down to the lake shoreline. We waited a little while for him to show up. Unfortunately we didn’t see him till we had left, but here is our group photo. 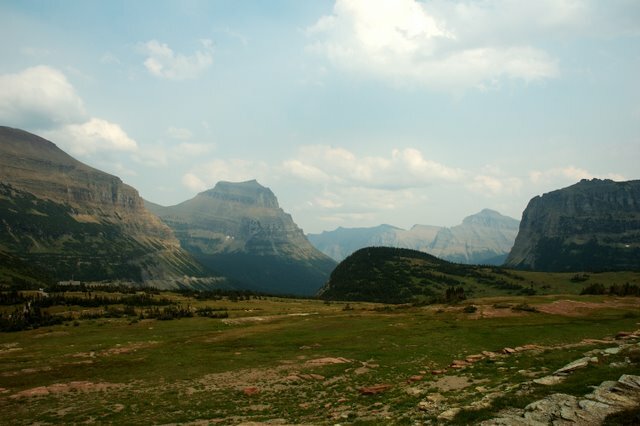 Once we made it back to the vehicles, we continued eastward along the “Going to The Sun Road.” It was breath taking as steep mountains surrounded our views with glacier formed valleys below. The smoke was creeping in from the west, but it still wasn’t bad for photos. Most of them were taken outside the car as we drove up to the next trail at Logan’s Pass. 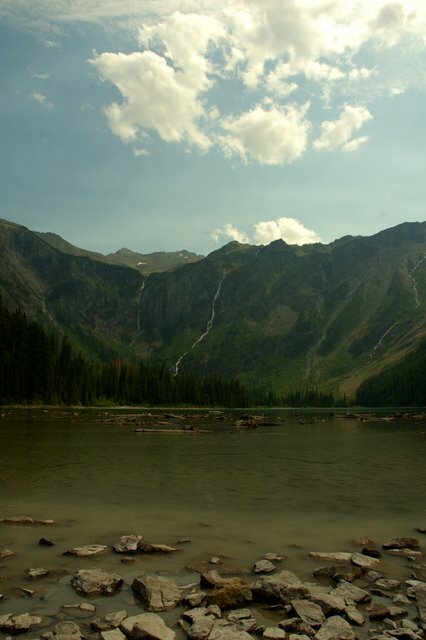 The alpine level is around 6600 feet at Glacier. Chris and I thought it was pretty cool to have the alpine level so low. Back at home it starts around 9000 feet. As the group proceeded pass the visitors center and up the trailhead, we came upon some incredible scenery and wildlife. 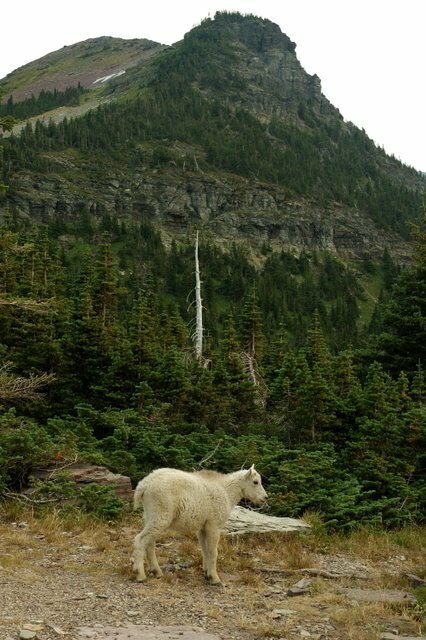 Mountain goats, marmots, ground squirrels, bighorn sheep, and minks were seen by most of the group. 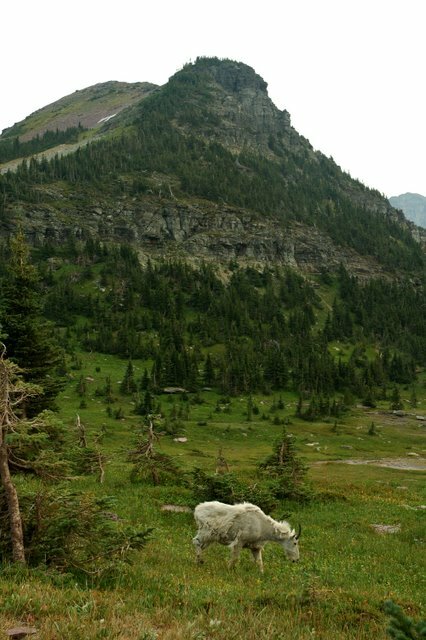 I was able to get some shots of the mountain goats and a baby too! Once we arrived at the look out, a few of us wanted to continue to head down the rest of the way. However, we didn’t have time and had already come 1.5 miles to the look out. The rest of the way was downhill for another 1.5 miles. We hung around a few minutes and decided to take a group photo. While Nate was setting up his camera, we were all shocked at what happened next. 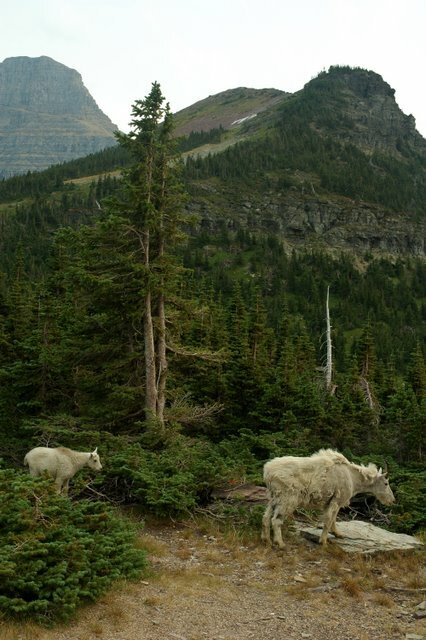 Two adult mountain goats and the baby came on the platform with us! We made it back downhill and found yet another surprise in the parking lot. Two Bighorn Sheep were eating food off the ground. 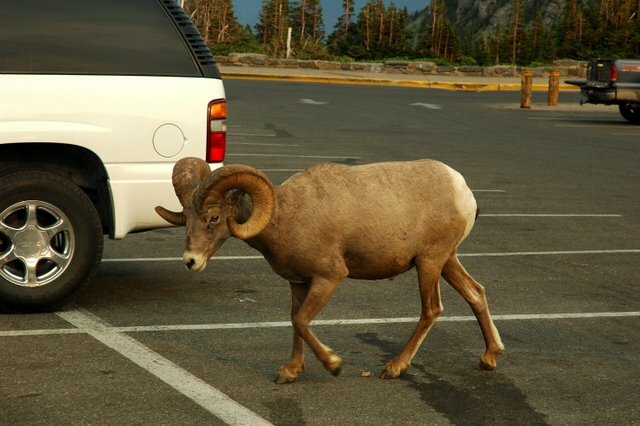 One of them was actually blocking our rental car haha. It was a neat site to see. We snapped a few photographs while they were nearby. 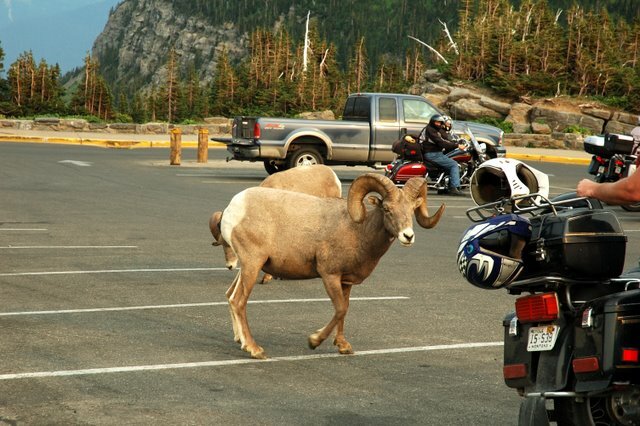 One of them approached a motorcyclist and he told the sheep “I don’t have any more chips left.” The sheep looked at him for a second as if it was disappointed and went on. Our very last stop in the park was at Sun Point Nature Trail. We actually got a little lost about 2 minutes on the trail. 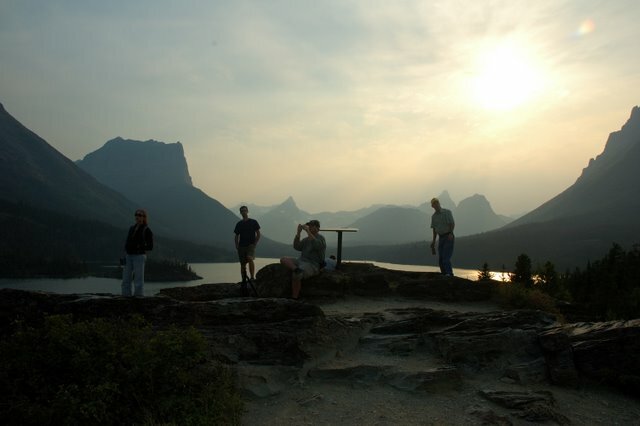 I thought it was great because we ended up at Sun Point, which over looks St. Mary Lake. The sun was a few hours from setting, but the approaching storm mixed with smoke made it appear to be really cold outside in the photos. Our travel time home was about 4 hours. 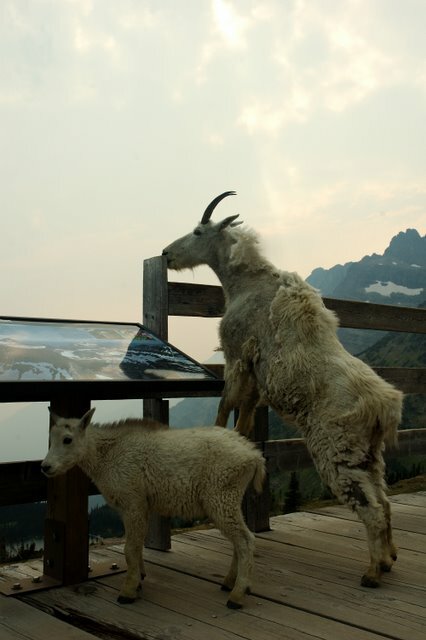 We didn’t get to go to the Goat Lick spot along highway 2, but we had seen so much I don’t think anyone cared. We stopped for gas once on the reservation and for a quick dinner at a convenient store. The only really exciting thing about driving back was almost hitting a deer. We arrived back at 1230AM and woke up the next day to a long work day.